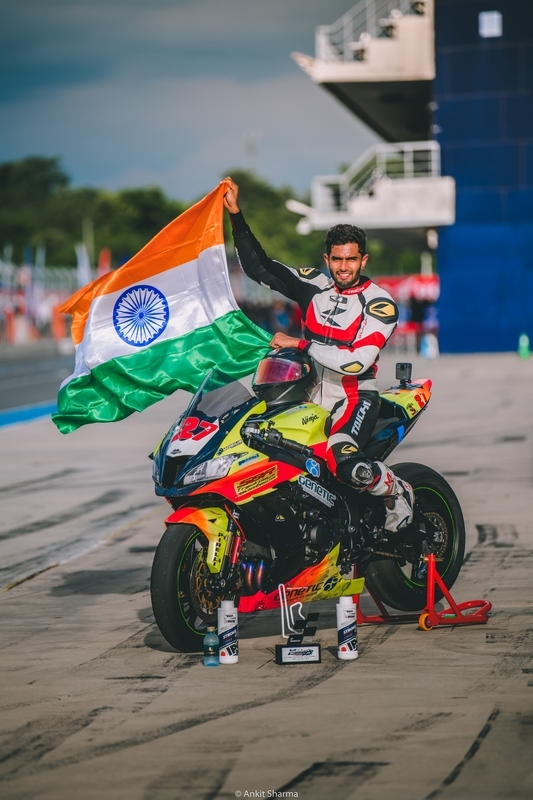 We talk to Sandesh Prasannakumar aka Sandy, who has been racing since 2011 and has more than his fair share of podiums under his belt, in this round of our ‘Have a seat, champ’ powered by JK Tyre, Castrol POWER1 RACING, OnePlus and autographix.com in which we talk to the racers who will be participating in the Final Round of JK Tyre National Racing Championship which will be held at the Buddh International Circuit from 16th to 18th November 2018. 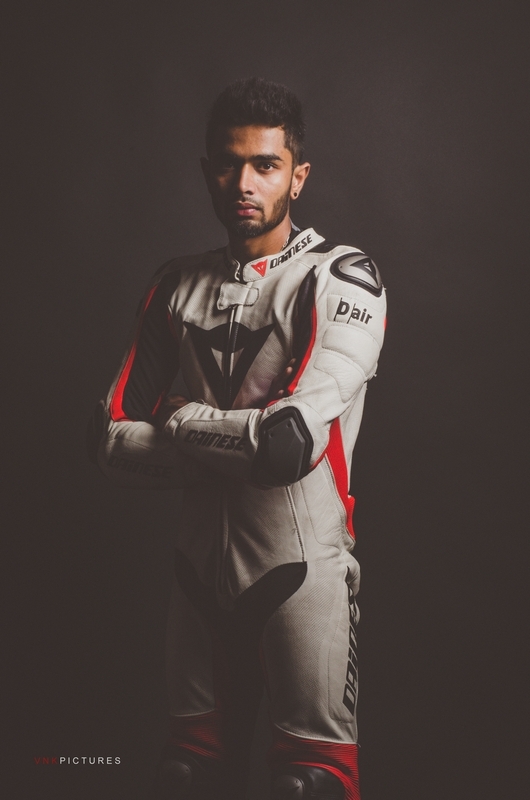 He’ll be racing in the 1000cc class of JK Tyre Championship aboard a Yamaha R1M (serious stuff). Here’s his answers to our questions. I started racing small bikes in national championship back in 2012. I started fighting for the championship title in my debut year. I progressed every year starting from Novice in 2012 and to expert category in National Championship in 2013/14. 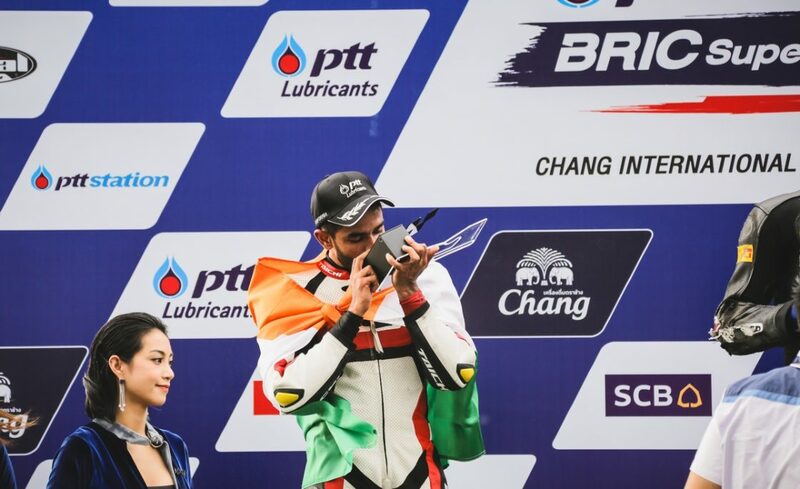 2015 was when I jumped to superbikes and started racing internationally representing India. Every victory or a podium is a result of a lot of hard work. A whole lot of it. So, all of them mean a lot to me but my Two International podiums are special. *Malaysia Superbike championship Superstock 1000cc P3. *2012 Yamaha one make runner up champion and National Motorcycle Racing 165cc runner up champion. *2015 MRF superbike (2 race wins). 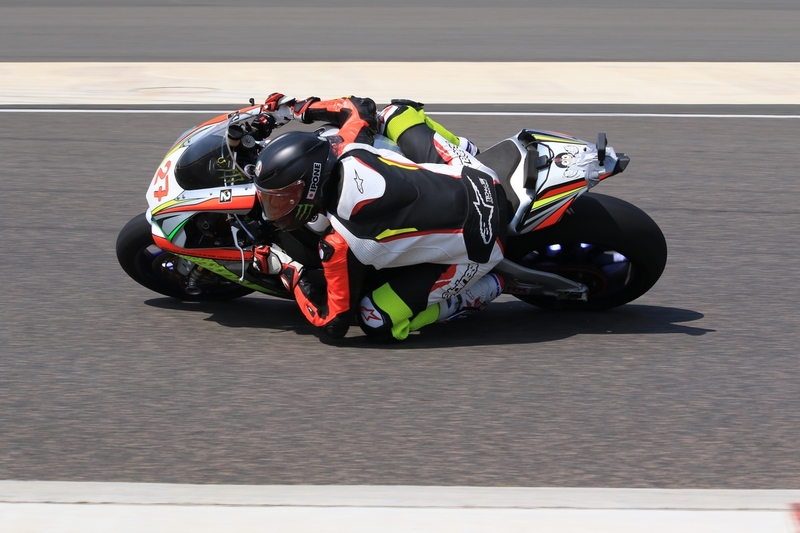 *2015 JK Tyre Superbike championship podium finish. *2016 JK Tyre Superbike Champion. I would want to win an overall championship in Thailand and I have my goals set to get in to a factory team support to achieve the same. I have been training in supermoto and motocross. In addition to that, a lot of time in the gym to win the title back at JK Tyre championship and I know I can if I work hard enough. Physically I make sure I hit the gym every day and do my cardio every morning. I have a Personal Trainer at the Outfit gym, Bangalore. Mental fitness is the most difficult as there are lot of things involved. I try to stay around with positive people so I have a calm mind before race. 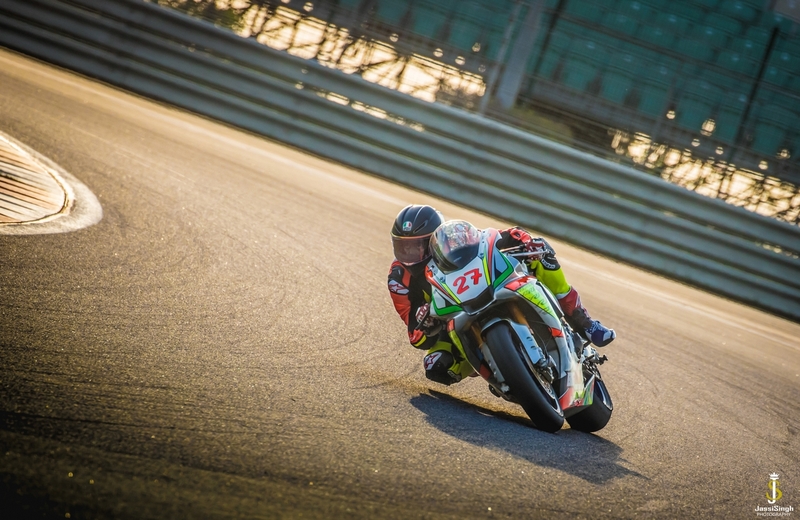 How important do you think is the JK Tyre championship for motorsports, particularly motorcycle racing in India? 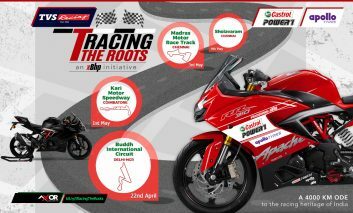 JK Tyre championship is the only super bike racing competition in India. So it’s quite important to everyone who can’t go race abroad. I hope they do more races in a year as an overall championship rather than doing just a support race in future. Superbike racing has crazy fans all over the country and JK Tyre has taken the initiative for all the riders to race here in India. The more the races, the merrier for riders. Fitness, hunger to learn on how to ride a super bike fast, being professional on and off the track and good technicians to prepare your bike. But the most important thing is to get proper training before racing. My bike had lot of problems after I crashed in testing in 2017 which tampered my race. We have managed to sort out all the problems with geometry as I got the help of an expert from Thailand with respect to setting up the bike according to my riding style. Now its just time to push hard on the track. I will be riding a Yamaha R1 M in 2018 JK Tyre championship. I have crashed many times, so much so that I have lost count of it. Every crash is surely a lesson, with respect to human error or mechanical problem. Which has surely helped me to not repeat the same again. Firstly, all the brands/organisers need to do more races in a year. One round is kind of not fair for the talent pool. 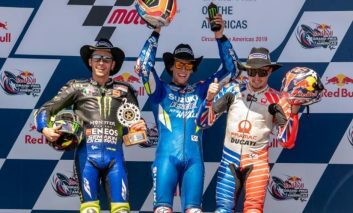 They need to select riders who are talented, keeping the politics aside and send them out for training abroad and signing them up for championships abroad. Most of the brands just opt/sponsor influencers rather than racers who work harder than any influencer to promote their product. Media coverage is most important in all of the races, which will educate people regarding the sport. Also, proper racing schools/lessons need to be conducted in India in order to bring out the talent.